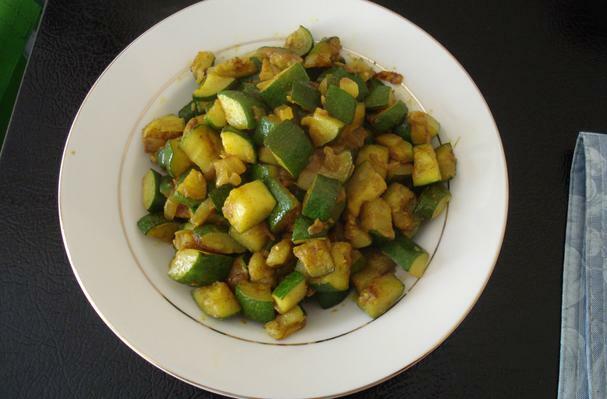 PREPARATION: Cut zucchini into small cubes mince the garlic; chop the anion and chilli finely. COOKING: In fry pan heat oil, add the chilli, onion and garlic. Sautee till everything is well mixed and turns a light brown color. Add zucchini, salt, curry spices and stir well. Cook 3 to 5 mins on medium high heat . Take off the stove and indulge yourself with the nice aromatic flavours of the islands. Ideal for wraps or side dishes. Nutritious, healthy and soothing for the soul.Very versatile dish!